user warning: Expression #6 of SELECT list is not in GROUP BY clause and contains nonaggregated column 'hotkilns_live.nodequeue_nodes_node.position' which is not functionally dependent on columns in GROUP BY clause; this is incompatible with sql_mode=only_full_group_by query: SELECT DISTINCT(node.nid) AS nid, node.title AS node_title, node_data_field_videos_category.field_videos_category_value AS node_data_field_videos_category_field_videos_category_value, node.type AS node_type, node.vid AS node_vid, nodequeue_nodes_node.position AS nodequeue_nodes_node_position, term_data.name AS term_data_name FROM node node LEFT JOIN nodequeue_nodes nodequeue_nodes_node ON node.nid = nodequeue_nodes_node.nid AND nodequeue_nodes_node.qid = 11 INNER JOIN search_node_links search_node_links_to ON node.nid = search_node_links_to.sid LEFT JOIN content_type_videos node_data_field_videos_category ON node.vid = node_data_field_videos_category.vid LEFT JOIN term_node term_node ON node.vid = term_node.vid LEFT JOIN term_data term_data ON term_node.tid = term_data.tid INNER JOIN node_access na ON na.nid = node.nid WHERE (na.grant_view >= 1 AND ((na.gid = 0 AND na.realm = 'all') OR (na.gid = 0 AND na.realm = 'content_access_author') OR (na.gid = 1 AND na.realm = 'content_access_rid'))) AND ( (node.status = 1) AND (node.type in ('videos')) AND (search_node_links_to.nid = 425 ) )GROUP BY nid ORDER BY nodequeue_nodes_node_position ASC, term_data_name ASC in /home/hotkilns/public_html/sites/all/modules/views/includes/view.inc on line 814.
user warning: Expression #6 of SELECT list is not in GROUP BY clause and contains nonaggregated column 'hotkilns_live.nodequeue_nodes_node.position' which is not functionally dependent on columns in GROUP BY clause; this is incompatible with sql_mode=only_full_group_by query: SELECT DISTINCT(node.nid) AS nid, node.type AS node_type, node.vid AS node_vid, node.title AS node_title, node_data_field_pdfs_category.field_pdfs_category_value AS node_data_field_pdfs_category_field_pdfs_category_value, nodequeue_nodes_node.position AS nodequeue_nodes_node_position FROM node node LEFT JOIN nodequeue_nodes nodequeue_nodes_node ON node.nid = nodequeue_nodes_node.nid INNER JOIN content_type_pdfs node_data_field_pdfs_international ON node.vid = node_data_field_pdfs_international.vid INNER JOIN search_node_links search_node_links_to ON node.nid = search_node_links_to.sid LEFT JOIN content_type_pdfs node_data_field_pdfs_category ON node.vid = node_data_field_pdfs_category.vid INNER JOIN node_access na ON na.nid = node.nid WHERE (na.grant_view >= 1 AND ((na.gid = 0 AND na.realm = 'all') OR (na.gid = 0 AND na.realm = 'content_access_author') OR (na.gid = 1 AND na.realm = 'content_access_rid'))) AND ( (node.status = 1) AND (node.type in ('pdfs')) AND (node_data_field_pdfs_international.field_pdfs_international_value = 1) AND (search_node_links_to.nid = 425 ) )GROUP BY nid ORDER BY node_data_field_pdfs_category_field_pdfs_category_value ASC, nodequeue_nodes_node_position ASC, node_title ASC in /home/hotkilns/public_html/sites/all/modules/views/includes/view.inc on line 814. 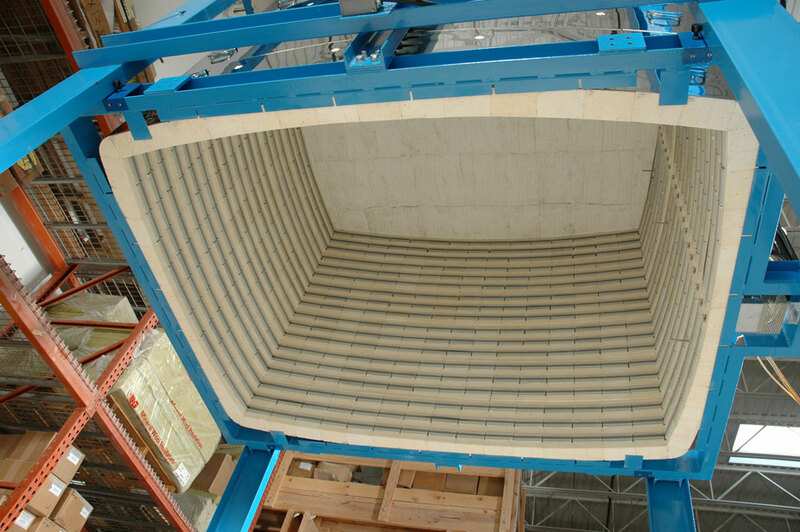 L&L Kiln Mfg., Inc. makes large-format industrial-grade Bell-Lift kilns designed for industrial ceramics and other industrial applications. One model is 100 cubic feet (66” wide by 47” deep by 54” high). Larger and smaller models can be built. 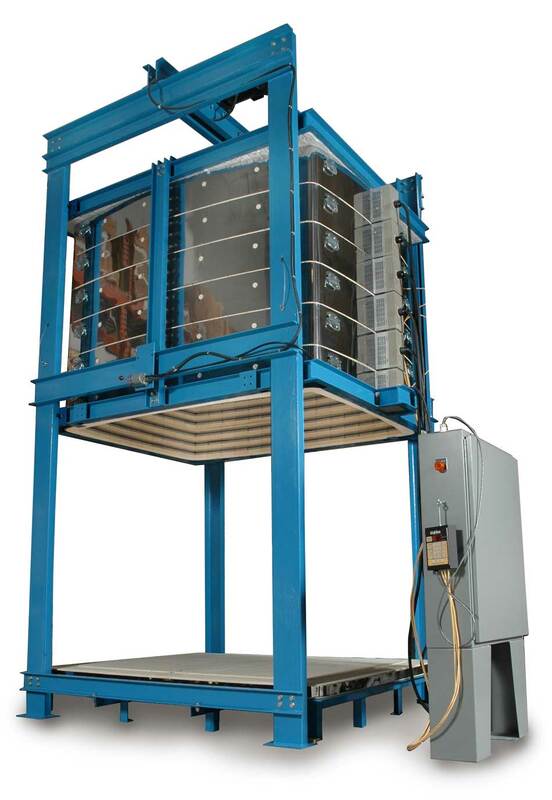 The kiln reaches 2350°F (1290°C or cone 10). It is easy to load, easy to maintain and very economical. 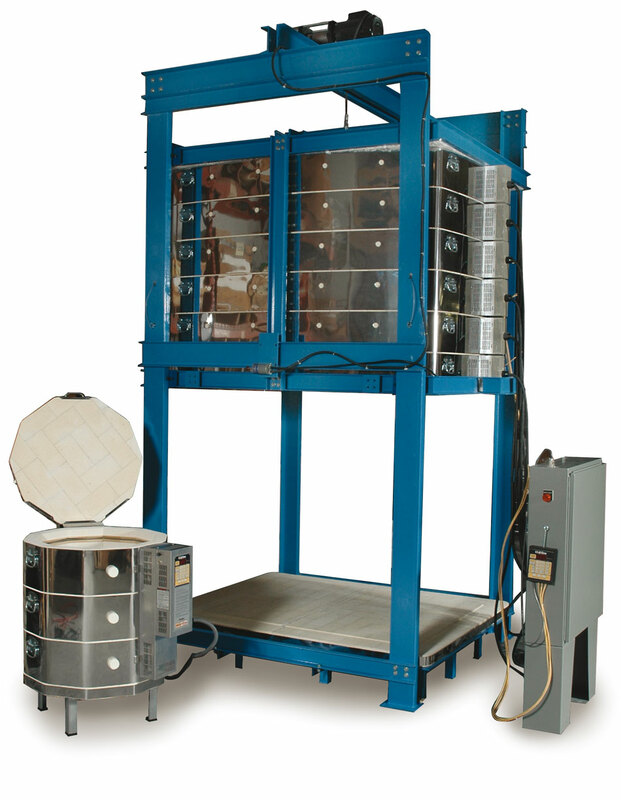 The welded metal frame breaks down for easy shipping (the entire kiln can fit on one flatbed truck or a shipping container). Assembly is straightforward- see this page for assembly photographs. 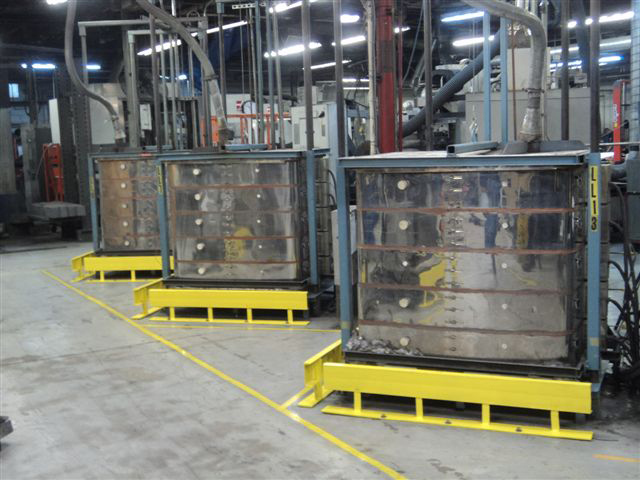 Three Jumbo Bell-Lift Kilns used for ceramic armor.